Apart from the warmer temperatures, my favorite thing about spring is the much anticipated return of our hummingbirds. Anyone who knows me will attest to the fact that I love my hummers. I’ve been known to spend several hours outside, dressed in red shorts and a red t-shirt, next to the feeder, in order to capture a photograph of one of God’s magnificent creations. In time, they grow accustomed to my presence. Often they’ll come investigate my camera, since it’s also red. The most common hummingbird in the Carolinas is the Ruby-throated Hummingbird. They’re also the smallest bird. A hummingbird can rotate their wings in a circle, allowing them to be the only bird that can fly backwards, up, down, sideways or stay perfectly still in space. For such a tiny creature, these birds use more energy, and eat constantly, despite weighing only 2 to 3 grams. If we ate as much as a hummingbird, we would have to eat around 30,000 calories a day. They must eat late into the night and be early risers in the morning because if they sleep too long, they could starve to death. The hummingbird has the largest heart in proportion to its body. It pumps 200 beats per minute at rest and 1000 during flight. They expend a huge amount of energy on their down and upstroke, so they must stay fortified. Nectar, from certain flowers, is their primary source of food. We mix sugar and water in our feeders. The sweeter the juice, the more exciting and acrobatic the wars become. The aggressive behavior is typically strong in early summer when the birds claim their territory and defend their nests. Hummingbirds are intensely territorial when it comes to their feeding source. They appear to be the most angry and selfish well into the fall, as they fight for their prime feeding territory, in preparation for migration. These ill-tempered birds can be amazing to witness as they battle to maintain control of the feeder. Sharing doesn’t come easy to these little guys. In fact, these feisty, delicate creatures have no concept of sharing. If another bird dares a quick sip at the feeder, while one is already drinking, he’ll make his move. In a split second, he swoops out of the sky and rams him off the feeder. They’re absolutely incredible creatures. If you want to add some excitement to your backyard, hang a hummingbird feeder or two and watch the wars begin. Last year, I finally was able to attract hummers to a feeder. We enjoyed them all summer. One day when I wad refilling a feeder and carrying it back outside,.a hummer almost flew in the house. We looked at each outlet for a few seconds through the patio door before he flew off. We enjoy feeding and watching all the birds. Spring brings us flowers and longer days. I’m happy you were able to enjoy the hummers last year. Hopefully you will this summer as well Sometimes it takes a while to get them to come, but once they do, they’ll stake out their territory. LOL! I’d love to have one come inside for a visit! Thanks for stopping by. I love the hummers! We get Ruby throats here, as well. The boys and I enjoy watching them as they sneak up to the feeder checking for others before they dash in to drink. Inevitably, another will come and a chase ensues. They’re just so much fun to watch…who needs TV? I wish I had their energy, don’t you, Elizabeth? Thanks for reading! Yay! Another hummer lover! So did you win the battle, Melissa? Unfortunately they haven’t returned to our area yet, but very soon. I love other birds too. I’ve tried to put out suet, but our resident raccoon keeps swiping it. One night, he took the entire feeder. :) Thanks for stopping by! Thanks for the post, Jill! I’ve always considered the first sighting of a yellow daffodil as the return of spring and rebirth of the earth (however, this year they came really early). I’ll admit, I don’t know much about birds, but I’ve always held great affection for the little hummers. Fascinating tidbits about them, so thanks for sharing! :) My husband loves to hang the bird feeder every year, but we also have a lot of squirrels that try to steal from it. I’d like to know what font you used in order to get the font of your post to look so dark (seriously; you can send me a pm, if you’d like). Lastly, from your bio, I think it’s cool that your relationship with your husband blossomed on the links! Fun little tidbit here: I’m related to a former U.S. Open and Masters winner. :) He lives right up the hill from me, as a matter of fact. Care to guess (if you pay attention to the PGA golfers)? And I was a paralegal before “transitioning” to write full-time. Thanks again, and enjoy the spring weather! Oh, I love the daffodils too, JoAnn. The hummers are so fascinating. I never knew they could fly backward until I started reading more about them. Okay, now you have me sooooo curious. Yes, I do follow the PGA tour, but no Durgin is coming to mind. As for the darkness of my post, I typically type posts in Word and make it bold before I copy and paste. I suppose I assume everyone has bad vision like myself. :) Thanks for reading! Fuzzy Zoeller is the PGA golfer. He’s on the senior tour now. His oldest daughter was the flower girl in our wedding. You might be too young to remember him. Thanks for the tip on the font/bolding. I bold certain words, but your post is easier for me to read, that’s for sure! :) Blessings. Love the Spring for the arrival of new life. Me too, Linda. After a cold and brown winter, it’s so nice to watch everything come back to life. I always enjoy the first rabbit sighting too. Thanks for stopping by! I love all the flowers and trees blooming and the birds chirping. Same here, Marylin…but unfortunately for the first time, the pollen is getting to me. But, it’s worth it! I enjoy hearing the birds too. Thanks for reading! I would love to see hummingbirds! They’re amazing! Thanks for including these photos! I love to see the birds returning to the trees, and to see the new birds that are born in the spring. And I love the flowers that begin to spring up! It’s always fun to see and hear the baby birds. Thanks for stopping by! Oh my gosh, Deb! Are you kidding? They’re very attracted to red and sweet nectar…perhaps you smell extra sweet to them. :) You’re dive-bombed by the hummers and I’m attacked by the wasps. I’d be happy to trade with you. Thanks for reading! LOL! Your comment cracked me up Lee! I’ll have to keep your experience in mind for a future story. 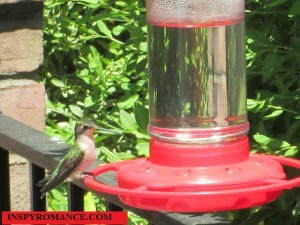 :) I’m not a huge nature gal…not a fan of bugs and certain critters, but the hummingbirds do put on a show. Thanks for making me laugh! You paint a beautiful picture with your words, Wendy. I do love autumn, even though I know the cold winter is around the corner. I’m happy you enjoyed the photos. These little fellas are quite photogenic. Thanks for stopping by! My mom loved to feed the birds. She had several bird feeders and in the winter even had a heated bird bath so the sparrows could have fresh water to drink. After she passed and my father lived in an assisted living facility, he took care of the bird feeders outside the dining area. How nice that your mother provided a heated bird bath, Renate. That’s a wonderful idea. I’m sure while taking care of the bird feeders at the assisted living, your father felt your mother’s presence. Thanks for sharing this. Jill, somehow I missed yesterday’s post. I love hummingbirds, too. I have two feeders in my yard, but we have other birds who like to help themselves to the nectar. The woodpeckers are the worst. Right now both of my feeders are empty. I need to refill them. One nice thing about living in AZ is having hummingbirds all year. 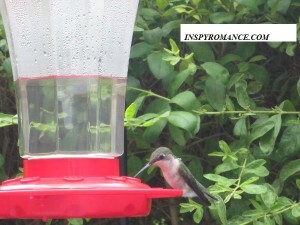 The first hummingbird I ever saw was while vacationing in Arizona, Merrillee. I feel in love with them. I love all birds and enjoying feeding all of them, but hummies are my favorite. I had no idea woodpeckers would go after the nectar. You’re blessed to have them year around. That is some amazing info about hummingbirds. They’re incredible creatures. God is a such an amazing designer! I love the temperature in the spring! I love being able to go outside and not be too cold or to hot. I also love the fields of bluebonnets here in Texas. They’re just gorgeous. They are incredible, aren’t they? I agree, God is an amazing designer! I’ve never been to Texas, only the airport, Julie. I’ve seen photos of the bluebonnets, but never in person. I’m sure they’re spectacular! Thanks for stopping by. I’m with you on all three, Sheila! Enjoy and Happy Easter! We live in southern Illinois and we love the hummingbirds too! I’m always thankful for warmer temperatures because I’m always cold. It’s also quieter in our house during the warmer months because everyone else loves to be outside, I can read in peace. Like yourself, I’m always cold too, Beth, so I welcome the warmer temperatures. Ah…reading in peace…that’s the best! Thanks for reading! I live on the Oregon coast, so our most seen birds are the Anna’s hummingbirds. I don’t have feeders for them, but have wanted to put some up one of these years. However, I hesitate as I I would hate to attract the bees, wasps and hornets too! I’ll have to Google the Anna’s…I’m not familiar with them, Trixi. You’re right, about the bees. For several years, we never had an issue with them, but last year the wasps were very persistent. I watched one consistently scare off a poor little hummer who only wanted a drink. Oh yes! The peeper frogs…love them! Enjoy! Thanks for reading.